Alerts on environmental issues you care about delivered to your inbox. 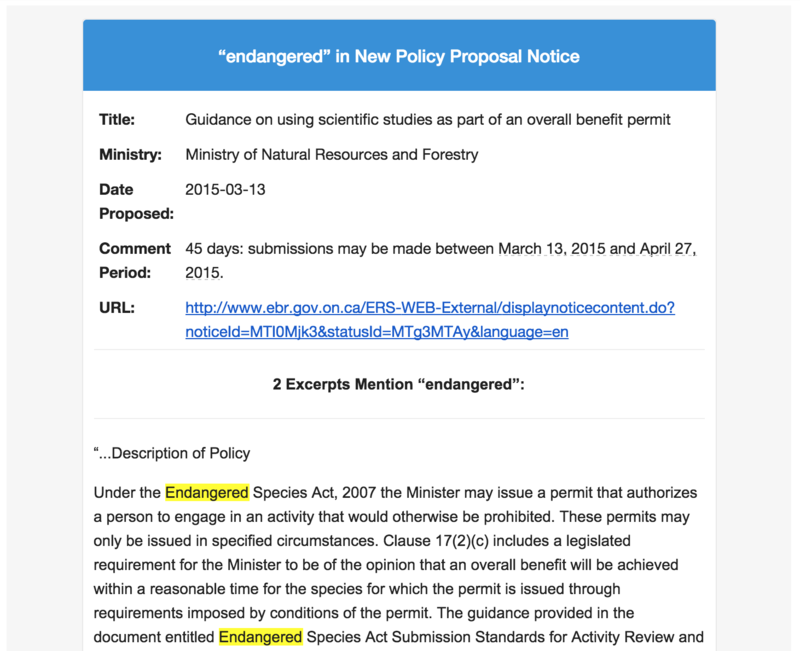 Get email alerts about notices on the Environmental Registry that may interest you — as they are posted. You have the right to know when the Ontario government is planning to do something that may affect the environment — and you can have a say. Now, you can stay on top of the issues you care about with the help of Environmental Registry Alerts. When the Ontario government proposes something environmentally significant, it posts information about the proposal on the Environmental Registry for public comment. When the government makes a decision, it posts another notice explaining that decision. You can sign up to receive alerts when notices about topics that interest you are posted on the Registry. It's easy: just enter keywords or phrases that reflect your interests. You can add, delete or revise your keywords anytime. Environmental Registry Alerts monitors the Registry, and sends you an e-mail when new notices that contain your chosen keywords are posted. The Environmental Registry is where government actions that affect the environment are posted. This service monitors that registry for the keywords that our users monitor and sends them an email when there is a match. This service is offered as a public service by the Environmental Commissioner of Ontario. The Environmental Commissioner of Ontario (ECO) is the province's independent environmental watchdog. Appointed by the Legislative Assembly, the ECO is tasked with monitoring and reporting on compliance with the Environmental Bill of Rights, 1993 and the government's success in reducing greenhouse gas emissions and in achieving greater energy conservation in Ontario. The Environmental Commissioner of Ontario is not responsible for any consequences arising from missed Registry notices. Under the Environmental Bill of Rights, the Environmental Registry site at http://www.ebr.gov.on.ca/ is the authoritative source for public notices about environmental matters being proposed by Ontario government ministries. Environmental Registry Alerts is a public service offered by the Environmental Commissioner of Ontario. We'd love to hear from you! Help us improve this service. Send your questions or comments to commissioner@eco.on.ca. 12th Floor, 40 St Clair Ave W.